(libcom.org) A three week strike involving 5,000 workers at an electronics company in Shenzhen, China, has ended after the bosses agreed to a 20% hike in pay. The strike started on the 31st October after the factory owners, ASM materials, announced – without consultation with the unions – that it would be relocating elements of its production outside of Shenzhen. Thousands of workers walked off the job, demanding a wage rise of 3,000 Yuan a month, and a compensation package for re-location. There has been widespread local media interest in the story, which led to a solidarity protest by trade unionists across the border in Hong Kong at ASM’s company headquarters. Although falling short of their initial demands, the workers are said to be pleased that they have won a 20% pay increase and an accommodation allowance for those who are prepared to relocate, and a compensation package for those who do not wish to move. Many of the workers are planning on donating their pay rise to several colleagues who had been dismissed by the bosses for their role in organising the strike. (TWN, AFP) – November 20, 2011 BEIJING – More than 7,000 workers went on strike at a southern Chinese factory making New Balance, Adidas and Nike shoes, clashing with police in a protest over layoffs and wage cuts, a rights group said. Dozens of workers were injured on Thursday as police tried to break the strikers’ blockade of the main road in the factory town near Dongguan in Guangdong province, China Labor Watch said in a statement late Friday. The strike at the Yucheng factory in Huangjiang township took place in the wake of layoffs last month of 18 managers, a move seen by workers as a preparation for the factory’s relocation, the New York-based group said. One of the fired managers told the China Business News his departure was part of a plan to shift production north to Jiangxi province to save on rising costs in the Pearl River Delta around Dongguan, a key manufacturing center. The strike was the latest in a series of incidents involving labor disputes and perceived social injustices in Guangdong, known as the workshop of the world for the tens of millions of migrant workers who toil in factories there. Workers at the Yucheng factory were also angered by the recent elimination of performance bonuses and a ban on the overtime they said they need to meet the cost of living. (AlJazeeraEnglish) on Sep 21, 2011 iProtest follows activist Debby Chan as she works to gather evidence against Foxconn and Apple, often at great risk to herself. Beijing fears an uprising of the masses as angry men set fire to police cars, attack officials and build barricades in the southwest of China. BEIJNG – In southwest China, in the early hours of Friday, August 12th, thousands of people were engaged in violent confrontations with the police. As the state news agency Xinhua reported, the protests began in the Qianxi district in Guizhou Province on Thursday evening. According to a report by a government news channel, angry protesters put cars on fire and built street barricades. At least ten policemen were injured in the riots, the report says. An official radio station reported that the riots erupted after a driver, who was parked wrong, got into an argument with city employees. No pictures of the incident have been officially released, but photos, allegedly made during the night, are shown on the Chinese-language Canyu website. A crowd can be seen standing around a damaged police vehicle, the car is upside down, the windows are smashed. Another photo shows thousands of people gathered in a square, some filming or taking pictures with cell phones. Something is burning brightly at an intersection, presumably a car wreck. However, we can not confirm that the photos actually show the protests in Qianxi. Xinhua reports that ten people who allegedly attacked the vehicles have been arrested. Ten cars were destroyed and five others were set on fire. 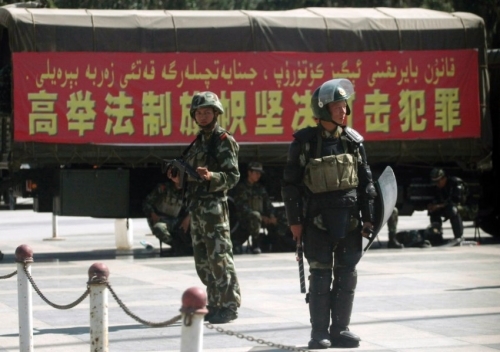 Since the beginning of the year, the Chinese government has been fearing that the Arab spring could spill over into their own country. There have been repeated clashes in recent months, but little known details emerge out of the authoritarian country. 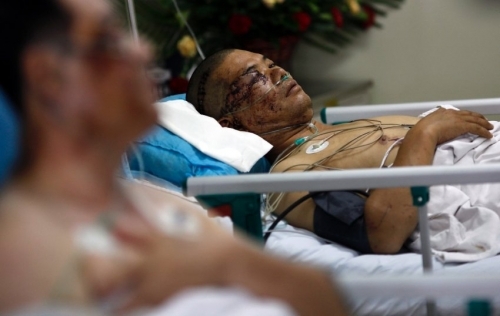 In late July, it came to riots after the death of a disabled peddler in another town in Guizhou. 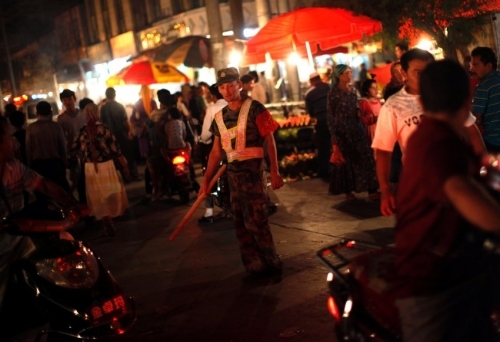 The death of the one-legged fruit seller was blamed on so-called Chengguan officials. Urban security forces, who are generally very unpopular in China, are repeatedly being accused of excessive force. And even after a train accident in which several people died , there were mass protests. So far, however, no organized movement seems to have been formed. According to a study, there were nearly 90,000 such incidents in China in 2009 alone. The study was created by two scholars at Nankai University in North China. Other estimates are much higher. The Beijing regime systematically suppresses critics, including the human rights activist Wang Lihong, who is currently due in court for participating in a demonstration. He risks several years in prison. (blogs.villagevoice.com) Ai Wei Wei, the prominent artist and outspoken critic of the Chinese government whose arrest on April 3, 2011, spawned international demonstrations and outcry, has been released on bail. Via cell phone, the previously vocal artist and prolific tweeter reportedly said :”I’m released, I’m home, I’m fine… In legal terms, I’m — how do you say? — on bail. So I cannot give any interviews. But I’m fine.” The Wall Street Journal reports that the artist has been banned from talking to the media for one year as a condition of his release — that includes Twitter posts.